It’s almost that time of year again. 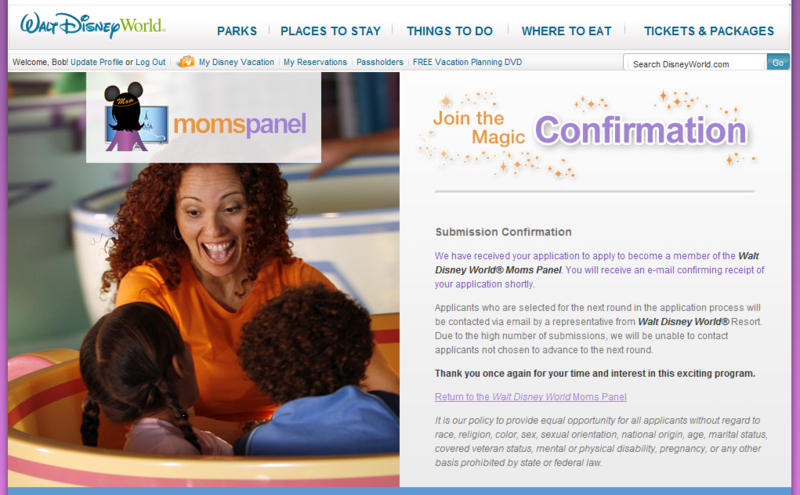 The Disney Parks Moms Panel 2014 Search is coming soon…. Help Spread Some Vacation Pixie Dust – Coming Soon! Have you and your family experienced numerous Disney Parks vacations? Do you consider yourself a “go-to” person who is always on the lookout to help a friend plan a magical Disney vacation? If you answered yes to these questions, we’d like to hear from you! Since then, the panel has become a valuable resource for thousands of Disney Parks guests. It’s also grown in breadth since its initial launch. Now, Disney Parks Moms Panelists not only help plan magical vacations for guests heading to Walt Disney World Resort, but also answer guest questions about Disneyland® Resort, Disney Cruise Line®, Disney Vacation Club®, runDisney® and ESPN Wide World of Sports® Complex. When I first applied back in 2008, I hadn’t visited the Walt Disney World Resort since 2003. Needless to say, I did not make it past the first round of applicants. Since then, however, I have visited Walt Disney World at least once a year. I’ve also applied to be on the Moms Panel every year. It may seem crazy to some, but I know that I should never give up on my dreams. 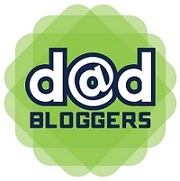 I’ve shared parts of my roller coaster journey in a few blog posts, which can be found in the WDW Moms Panel category, but my family and close friends have heard the most. All of the stresses, the excitement when I get an email telling me I am moving on to the next round, and the devastation when “my year” didn’t come once again. I’m happy that I’ve been persistent though, and that I keep on believing the dream that I wish will come true. I’ve been in the second round of applicants for the past three years. And last year was my first year making it all the way to the round three phone interview. What will my sixth year of applying hold? You’ll have to follow along with me to find out! In less than 12 hours I will be on one of the most important phone calls of my life…. 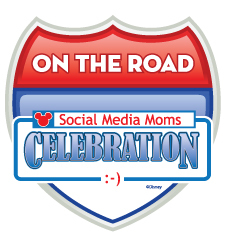 What an amazing journey it has been during this year’s Walt Disney World Moms Panel search! It has taken me five years to make it to the final round of the selection process and I already feel so incredibly blessed. Out of the literally thousands of moms and dads who apply each year, I am one of the few who have been selected for a phone interview. This is the final step before the 2013 Moms Panel is chosen. It’s a zip-a-dee-doo-dah day indeed! 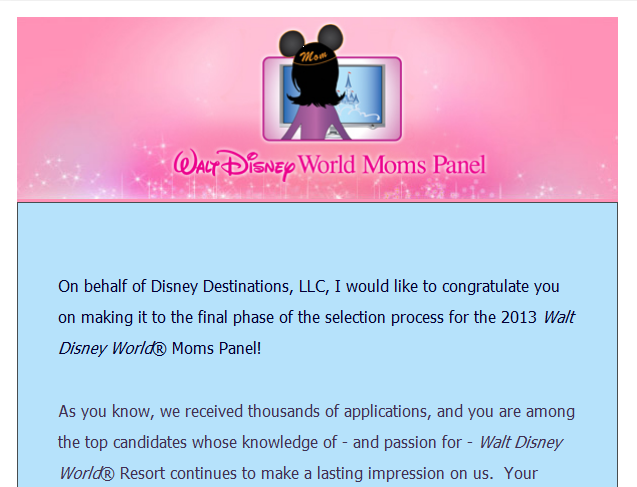 I am beyond excited to say that have made it to Round 3 for the 2013 Walt Disney World Moms Panel selection process! 😀 The phone interviews for this finale phase will begin next week. Thank you for all of the thoughts, prayers, support, and pixie dust. ºoº.•:*¨¨*:•.ºoº Congratulations to everyone moving on as well! After submitting my Round 2 essays and video, the past two weeks have seemed to go by very slowly. I know we’ve all been waiting anxiously, especially after last week’s #WDWMoms fun on Twitter. This is my fifth year applying to be on the Moms Panel and my fourth year making it to Round 2 of the selection process. If I am selected to move on to Round 3, I will be notified by email and have a phone interview set up. I’m feeling good about this year and would absolutely love to make it to Round 3 and beyond! Could this be my year? Keep the pixie dust coming…. ºoº.•:*¨¨*:•.ºoº I’ll keep everyone updated. I Made it to Round 2 of the 2013 Walt Disney World Moms Panel Search! It has been one looong month since applying for the 2013 search. The Round 2 questions must be answered and a 60 second video uploaded before midnight on Monday, October 15th. If I am chosen to move on as a finalist to the Round 3 phone interviews, I will be contacted early next month. Congratulations to everyone moving on as well! 🙂 Best of luck in these final stages of the selection process!